Connections among the Twitter users who recently tweeted the word kickstarter when queried on October 6, 2011, scaled by numbers of followers (with outliers thresholded). 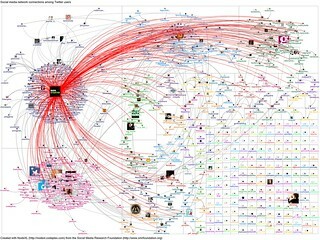 Connections created when users reply, mention or follow one another. Layout using the "Group Layout" composed of tiled bounded regions. Clusters calculated by the Clauset-Newman-Moore algorithm are also encoded by color. 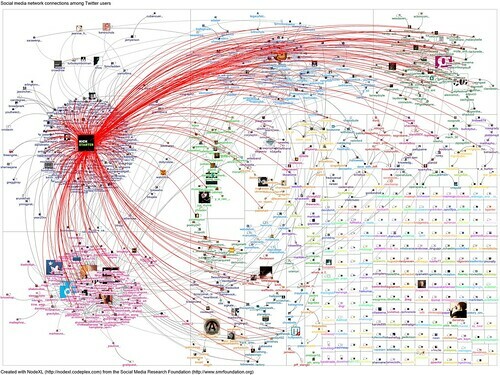 NodeXL is developed by the Social Media Research Foundation (www.smrfoundation.org) - which is dedicated to open tools, open data, and open scholarship.